Thomas Storey was born in 1931 in Kansas City, Missouri. 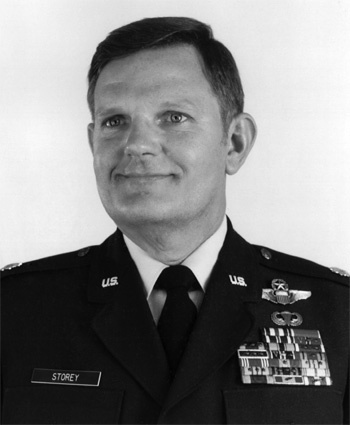 Upon graduation from Western Illinois University, Storey entered the U.S. Air Force Aviation Cadet program in 1953. He flew the T-6 Texan at Marianna AB, Florida, the T-28 Trojan and T-33 Shooting Star at Greenville AFB, Mississippi, and the F-84G Thunderjet during gunnery training at Luke AFB, Arizona. When the Korean War ended, he was discharged from active duty and he joined the Illinois Air National Guard in 1955. Storey flew the F-51 Mustang, T-33 Shooting Star, F-86E Sabre, and the F-84F Thunderstreak while in the Guard. During his six years with the IL ANG, Storey taught industrial and management curriculum in the Industrial Engineering Department at Milikin University, in Dacatur, Illinois. He was recalled to active duty with the 170th Tactical Fighter Squadron during the Berlin Crisis in 1961, and served at Toul AB, France. During this time he accepted a regular commission and remained on active duty with the Air Force. Storey next served as Wing Standardization and Evaluation Officer for the 12th Tactical Fighter Wing at MacDill AFB in Florida, where he flew the F-84F Thunderstreak and F-4C Phantom II. After a tour at RAF Alconbury, England, flying the RF-4C Phantom II with the 10th Tactical Reconnaissance Wing, Col Storey volunteered to go to Southeast Asia. He served with the 11th Tactical Reconnaissance Squadron in the 432nd Tactical Reconnaissance Wing at Udorn Royal Thai AFB, Thailand, and began flying combat missions in October 1966. On January 16, 1967, Col Storey was forced to eject over North Vietnam. He evaded capture for 5 days, but was tracked and found by dogs and shot by his captors in the ensuing chase. After spending 2,239 days in captivity, Col Storey was released during Operation Homecoming on March 4, 1973. After his return, Storey served at the U.S. Air Force Academy as Director of Operations for the T-41 Mescalero flying program and later as Deputy Commandant of Cadets. He was also assigned to Peterson AFB, Colorado, as the Chief of Services for the First Space Support Group. Col Storey's last assignment was as the Commander of the Army and Air Force Exchange Service in Japan, from August 1983 until his retirement from the Air Force on September 1, 1986. Col Storey wears Command Pilot Wings, the Parachutist Badge, and Combat Crew Badge. For the Period 16 January 1967 to 6 February 1967. 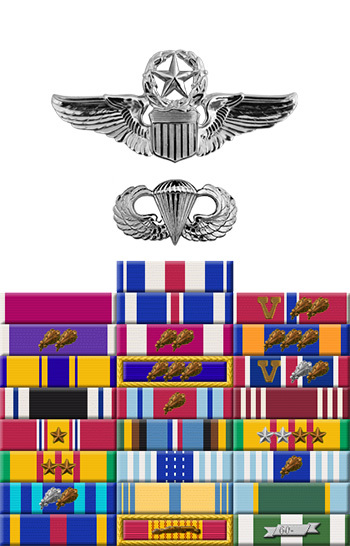 This officer distinguished himself by his gallantry and intrepidity in action in connection with military operations against an opposing armed force in North Vietnam. Colonel Storey was severely injured when his aircraft was shot down over North Vietnam. After evading capture for five days, he was tracked by a pack of dogs and shot by the enemy in an attempt to prevent him from destroying his survival radios. He was captured and forced to crawl down the mountain on his hands and knees and then to walk fifteen miles to the nearest road. He was repeatedly subjected to mistreatment and torture and denied medical treatment for his injuries. Colonel Storey resisted the enemy's demands by calling upon his deepest inner strengths in a manner which demonstrated his devotion to duty, and thereby reflected great credit upon himself and the United States Air Force.